Barn doors are identical with old or rustic nuance since this kind of door used in the barn house in the past. Once you have read more information about barn door typical characteristic, versions included sliding barn doors and interior barn doors. 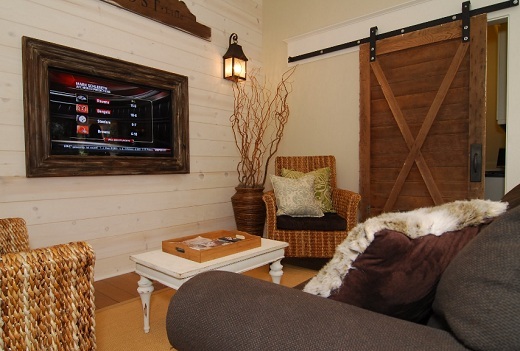 Currently, you can certainly use your creativity in decorating your interior design by incorporating barn door on it. There are some barn door application samples explained on the articles above, but if you prefer to get more samples of barn door applications, you can read an article below. The following descriptions contain of 15 inspirations of barn doors application to beautify your house. 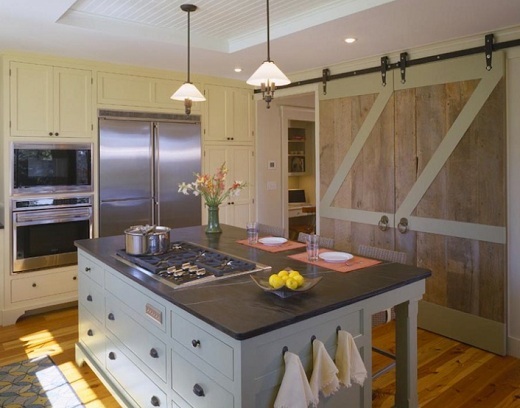 Large barn door with double panels is installed on the middle of wall which separated the kitchen to other room. It looks like if those barn doors removed, you will find that there is a big hole on the wall which allows you be able to see the other room from the kitchen. Solid wood planks with similar size are arranged horizontally to form barn door panel. On the upper area, cream wood planks are arranged in zigzag style to lock the horizontal planks and decorate the door. Ring handles hanging closer each other on the middle door to sign that this door consists of two panels. Actually, the color composition found in this kitchen is not match each other, but it is no problem as long as the most material used in this kitchen is wood which can connect them together. Unique accent is applied on this sliding barn door with square holes design on the upper part of door panel which allow you to see the next room. Two door panels are made with appropriate width to fit the door frame. Varnished wood painted in dark brown color look shiny and modern with unique black door handle and iron track hardware. Six square frames created on the upper part of each door panel are covered by clear thick plastic to replace real glass. Applying this kind of glass imitation makes this barn door lightweight which make its operation run smoothly without caused any rubbing sound. 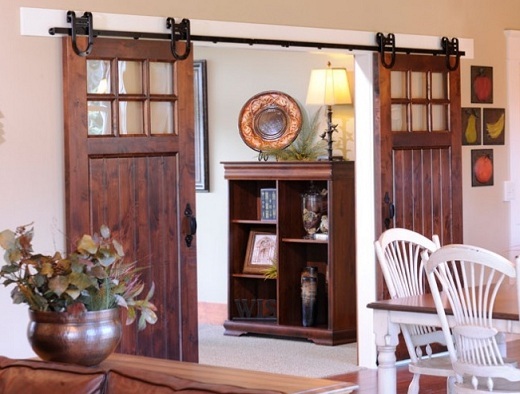 Barn door style is typically attractive because it has larger width than common house doors. Simple accent in this wooden house is also created by barn door application as an interior door to connect living room into other room behind the door. Without any wood planks arrangement style on this single sliding barn door, it looks modern than usual barn door. Solid wooden door panel is parted into two parts with different texture design. The upper part of panel is applied with trellis design that allows you can see the next room through without opening the door. The lower part of door panel has duty to perfectly cover the panel without any unique texture as like the upper part. 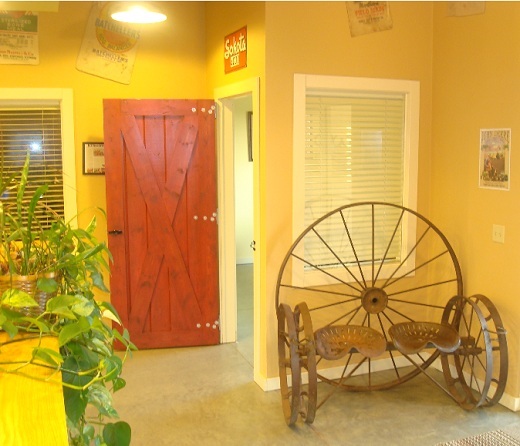 Western accent is really clear felt in this yellow room with installed swinging barn door on it. Single panel of the barn door is made of wood planks which arranged horizontally and locked by crossing planks on the middle. Wood stain and varnishing is applied on brown color wood paint of this barn door. Those brown color looks darker with yellow color reflection painted on the entire wall room. There are some nails adhered on the right side of door panel as decoration. Some posters stuck on the wall randomly represent a saloon with cowboy nuance. 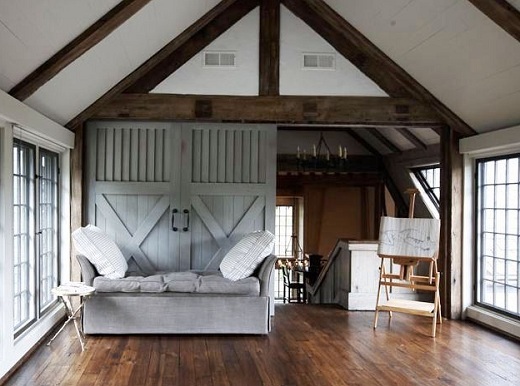 Grey paint color applied on double panel barn doors is harmony with window frame and couch color in this large attic. Wood planks floor warm this painting room with dark brown natural color. The double barn doors are installed as room divider to separate staircase area and this attic. But the barn doors only cover a half part of wall area to allow the classic staircase displayed from the attic. This double panel barn door is made of wood planks which are parted into two designs. Deep texture of wood planks arrangement is created on the upper part, while common wood planks arrange horizontally with crossing arrangement on the middle located on the lower part of each door panel. Moldy style on this old look barn door looks compatible to be combined with brownie living room. A double panel of barn door with small width is installed as sliding door to separate this living room with another room behind the door. The white brick tiles applied on the entire living room wall increase the old style of this interior design idea. Dark grey color covers the barn door with some white spot and shade applied randomly, this appearance make this door look very old and classic. The old style barn door is contrast with modern furniture placed in this cozy living room which is dominated with brown and cream color. But wonderful sensation is created in this room with that contrast accent. If we pay attention on the picture, there are two different rooms located in a line. The left room which is used as jelly or jam storage is as small as the right room which is used as home office. Both of room has different door frame shape that is separated by wall like a pillar on the middle. To decorate this plain space, the owner choose black-brown wooden barn door with single panel to cover that plain wall. Both small rooms are intentionally do not have any door, so the barn doors has double duty in this condition which are as sliding door especially for storage area and a decorative room divider. White slide track is installed above from the storage door frame into middle wall. 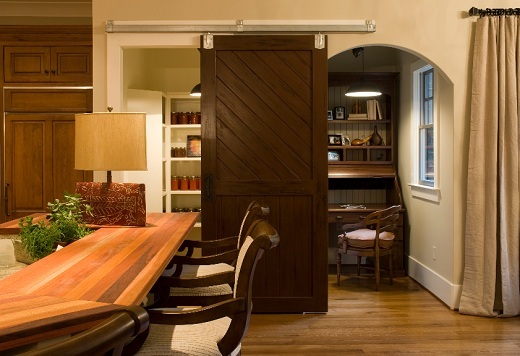 The barn door could perfectly cover the storage room, and this room divider could cover only a half part of home office room door frame when it slid to the middle wall. Tall wood planks barn doors are arranged in sliding door version to separate billiard room and living room in this house. Wood and brown nuance is applied in this house included the brown sofas, floor, window and door frame, and of course on this unique room divider. 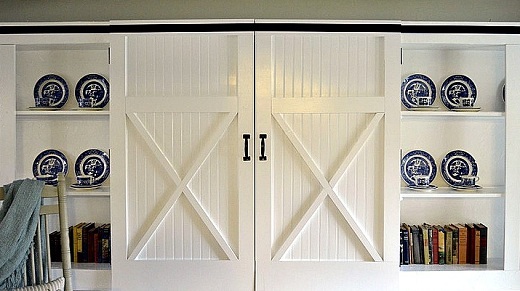 Two barn door panels are made of wood planks with Z wood planks arrangement on them. This Z arrangement on the barn door panel is arranged to opposite each other. 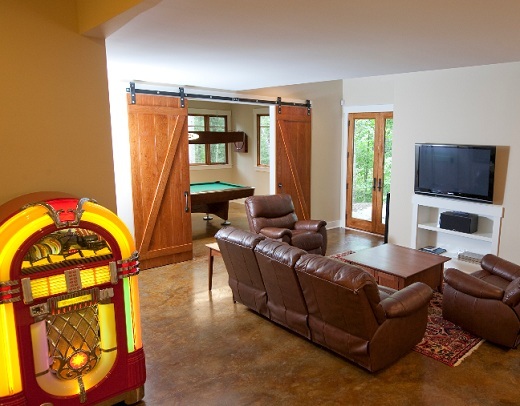 Long sliding track is installed above a large door frame on the wall between billiard room and living room. It is because both door panels are made as tall as room ceiling, it looks like a wooden wall in the living room or billiard room when the door closed. 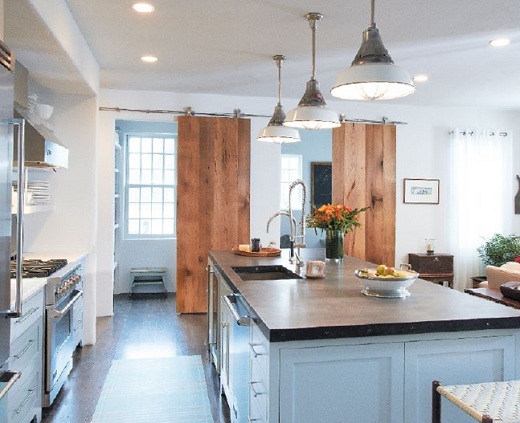 Natural texture of wood planks arranged to make double panels sliding barn doors looks appropriate to combine with wood metal material composition on cabinets in this kitchen. The brown color composition on those sliding barn doors makes them always look wet and fresh. Two door frames installed on the wall to separate kitchen to the corridor. Long sliding track is installed on the top of door frame to accommodate two-double panels sliding barn doors, so that they can cover those wall door frames. The entire of kitchen wall is painted in white, but brown color applied on the barn doors look harmony with brown wood floor and black-brown counter of kitchen cabinet. 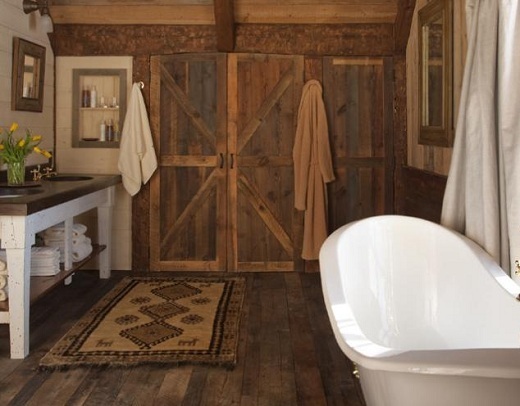 Double panels swinging barn door made of wood planks is very compatible to complete this farm house bathroom. This narrow version of barn door size fit the bathroom floor, wall and ceiling which also made of wood planks though they painted in different color. This pair of barn door looks unique with different wood color such as: deep blue, birch, brown, and dark brown displayed on each wood planks. This wood planks color composition make this barn door looks natural as if those planks directly cut from the tree and created to become bathroom door. Crossing birch wood planks arrangement is located on the middle barn door. This color condition make this barn door looks so natural among classic bathtube and double bathroom vanity placed in this bathroom. Who says that modern interior design could not be combine with ancient twist? The best combination of those contrast accent displayed clearly in this house. Single sliding barn door is selected to create ancient twist in this white room. This barn door is compatible as bathroom door behind it. Wood planks style becomes this barn door typical and it could remind you to old farm house door or room door of palace in the past era. Brown color of wood on this barn door perfectly blends with cream marble tiles on the bathroom floor adding by cream lighting illuminate those tiles. Some darker spots on the door panel make this door looks natural. 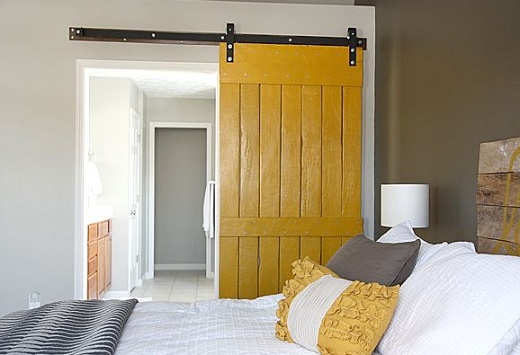 For this modern look of bedroom which painted in neutral color such as: white and grey, yellow single panel of barn door looks sweet be combined. Bright yellow paint is painted with glossy effect on wood planks arrangement of barn door which makes it smooth hanging on the sliding track. This chic door is used to cover a single door frame on the bedroom wall. When the door is opened, it slides to the next side of door frame. To fit the rustic theme, natural look of wood planks are arranged vertically and installed appropriately on the wall behind the bed as its head. Yellow line drawn on those planks is similar with the yellow color applied on a pillow cover located on the modern bed. If you remember about the door which commonly found in the historical war movie, you will get the clear description of this barn door. A barn door panel is made of wood planks with crossing planks on the middle. This door is arranged in sliding door version as a door between living room and other room. Old style door handle made of iron or chrome increases old accent on this barn door and antique living room. The door hardware included the door track is arranged to fill along the wall size above the door frame. This old style of barn door looks suitable to complete antique sensation for this wood living room theme. As like other common barn doors which found in the past and present, wood planks become the classic choice to make this simple room divider. Double panels of large barn door are arranged as room divider to replace the solid wall between large home bar and other large room in this big house. Those barn door panels are set as tall as the room ceiling so it can completely replace the wall. To simple the house owner in enlarging the room, sliding room divider is the best solution for it. Maroon color applied on the door panel looks harmony to fit the brown tiles on the floor. This color also suitable with white-blue color applied on the room wall. This large classic white barn door is installed in a large room to accommodate both large door panels. 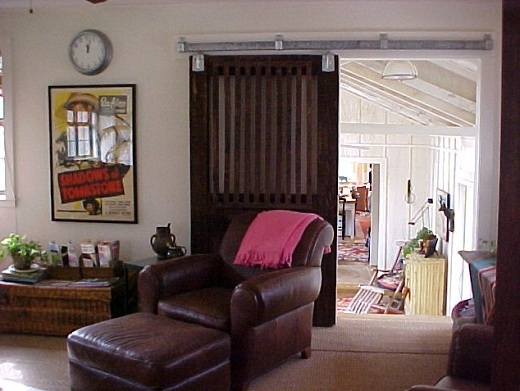 This barn door is design in sliding version to ease the owner to pull and push it into side as desire. Wood planks are still selected to create classic accent on this barn door room divider, crossing plank arrangement is located on lower part of door panel. A black trim applied above this barn door is used to imitate the door hardware. Large shelves with the same color as barn door are used to store antique plates and books collection on the right and left side of door. These shelves would be covered when the barn door is opened.